About Museum of Islamic Art, Raqqada. Unknown. Probably of Ifriqiyan fabrication. The main pendant-ring has an opening for insertion in the earlobe. Attached at the lower edge of this ring and pointing downwards are three spheres, each joined to the other and each extended at the base into cylindrical projections. These forms are decorated with radial grooves and lateral bands. Pointing upwards from the same lower part of the ring is a short spoke coiled at the top. Its purpose is unknown. These spherical shapes may well occur in some Muslim jewellery from both Eastern and Western areas, but we have not found anything similar to the Raqqada earring in the various collections that we have seen. 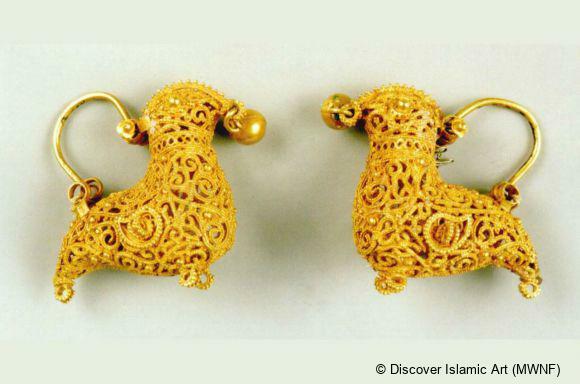 Only a very few pieces of jewellery from the early centuries of Islam survive. Tombs have not yielded much and Islamic religious institutions do not have treasures like Christian churches do. The dearth of documentation makes affiliation, evolutionary research and the dating of new finds within a coherent series very difficult. Things become clearer from the AH 5th / AD 11th century. 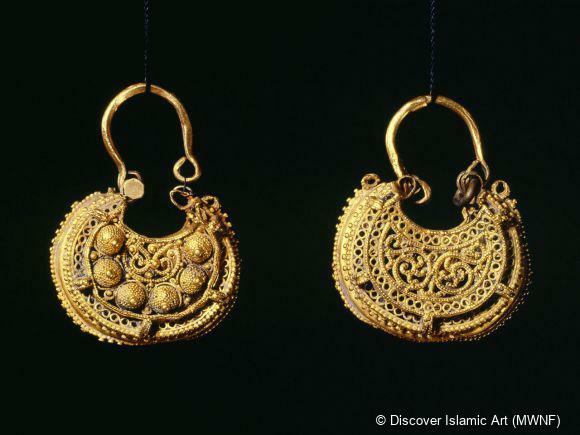 Although their spherical shape is similar to other Eastern and Western Islamic jewellery, these earrings are different from Raqqada Zirid and Fatimid pieces in their technique and decoration. Only a small quantity of jewellery has survived from the early centuries of Islam to enable them to be dated. This earring was found during the excavations undertaken in the 1960s on the Raqqada site. Raqqada was founded by the Aghlabids in the year 263 / 876. Its active life as a city continued up to the mid-5th / 11th century, when it was sacked by the Hilalian tribes. So the date of the earring could fall anywhere over the span of these two centuries. We unfortunately do not possess any information as to which archaeological layer the piece came from. However, this piece is technically and decoratively different from Fatimid and Zirid pendants. It has a more archaic and a definitely more classical appearance, which leads us to date it to between the 3rd and the early 4th centuries (9th to 10th centuries). 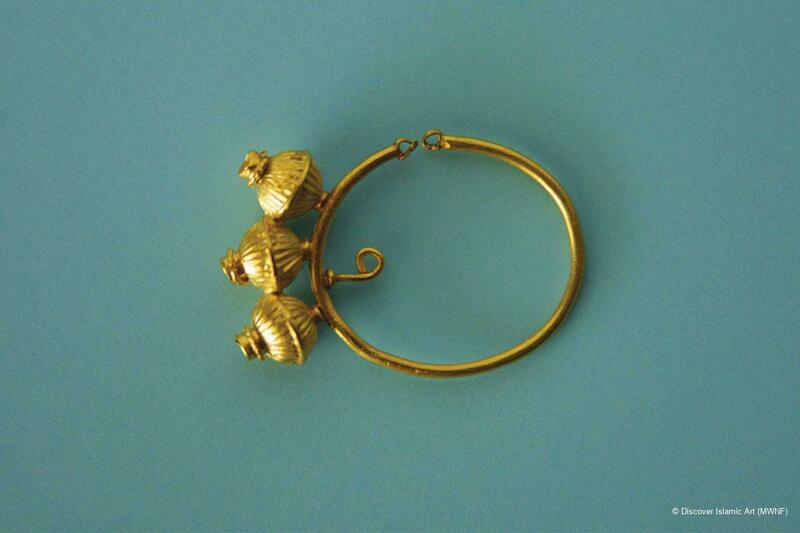 The earring was discovered on the Raqqada site, this earring was kept at the Institut National du Patrimoine de Kairouan. It was acquired by the Museum of Islamic Art at Raqqada in 1993 and displayed there. Ifriqiya: Thirteen Centuries of Art and Architecture in Tunisia, pp.174–6. Né en 1953 à Kairouan, docteur en archéologie islamique, Mourad Rammah est le conservateur de la médina de Kairouan. Lauréat du prix Agha Khan d'architecture, il publie divers articles sur l'histoire de l'archéologie médiévale islamique en Tunisie et participe à différentes expositions sur l'architecture islamique. De 1982 à 1994, il est en charge du département de muséographie du Centre des arts et des civilisations islamiques. Mourad Rammah est également directeur du Centre des manuscrits de Kairouan.